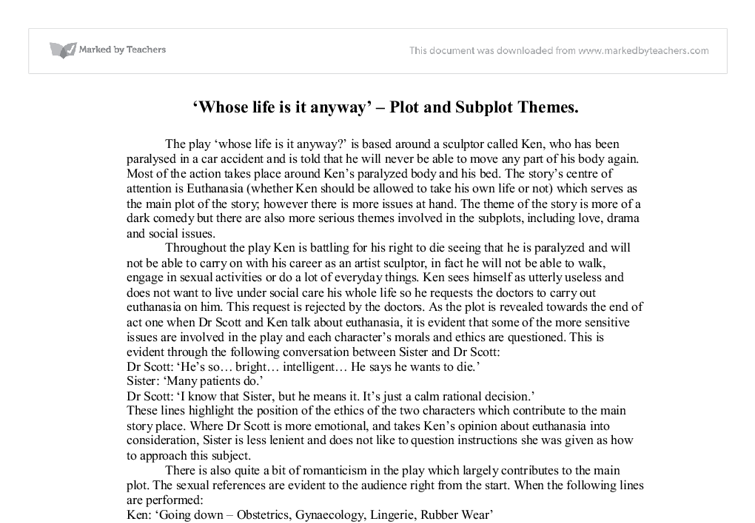 'Whose life is it anyway' - Plot and Subplot Themes. The play 'whose life is it anyway?' is based around a sculptor called Ken, who has been paralysed in a car accident and is told that he will never be able to move any part of his body again. Most of the action takes place around Ken's paralyzed body and his bed. The story's centre of attention is Euthanasia (whether Ken should be allowed to take his own life or not) which serves as the main plot of the story; however there is more issues at hand. The theme of the story is more of a dark comedy but there are also more serious themes involved in the subplots, including love, drama and social issues. ...read more. This is evident through the following conversation between Sister and Dr Scott: Dr Scott: 'He's so... bright... intelligent... He says he wants to die.' Sister: 'Many patients do.' Dr Scott: 'I know that Sister, but he means it. It's just a calm rational decision.' 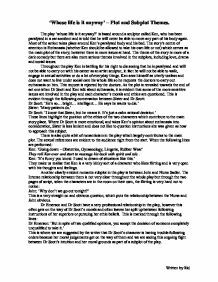 These lines highlight the position of the ethics of the two characters which contribute to the main story place. Where Dr Scott is more emotional, and takes Ken's opinion about euthanasia into consideration, Sister is less lenient and does not like to question instructions she was given as how to approach this subject. There is also quite a bit of romanticism in the play which largely contributes to the main plot. ...read more. This is a very straight on and obvious question, which puts the relationship between the Nurse and John obvious. Dr Emerson and Dr Scott have a very professional relationship in the play, however this often gets on the way of Dr Scott's morals and often leaves her split up between following instructions of her superiors or pursuing her ethic beliefs. This is marked through the following lines: Dr Emerson: 'But in spite of two qualified opinions, you accept the decision of someone completely unqualified to take it.' This is where we are suggested by the writer that Dr Scott's character is having trouble following orders because her moral judgements get on the way of them and we are seeing this ongoing fight between Dr Scott's intuition and her moral grounds as part of a subplot of the play. ?? ?? ?? ?? Written by Rid ...read more. biggest collapses in history and Britain dispatched a task force to recapture the Falkland Islands. Margaret Thatcher =The longest continuously serving prime minister since 1827. =Her conservative politics led to the implementation of radical conservative politics such as the poll tax. but Linda tries to convince him that he's amazing "to me you are. The handsomest. And the boys, Willy. Few men are idolized by their children the way you are." "You want vice-ridden vermin to enjoy themselves?" he asks. He argues that the play will teach "disobedience [and] revolution". However, as Phillip is in charge, the plan goes through in the end, under his word that the convicts should be educated and reformed. Margaret arrives and immediately disapproves "It's not locked! ", "You've been smoking". Margaret collects up the baby things, and shows how unsupportive she is of her daughter by saying "you had no idea! I told you, I told you!" and "Didn't you believe me?" The tempo throughout was medium, not to fast and not to slow, a cross between the extremes. The stage composition was logical and quite appealing in presentation. The performance was smoothly run and at appropriate times unified, which made it neat and easy to follow even while changing costume, the characters did not fidget outrageously. At the end of this scene we learn that Peachum's daughter, Polly, has gone missing, Peachum deplorably expresses that he is not concerned for his missing daughter but is instead more concerned that he will no longer be able to make money from Polly; upon hearing this, the audience begins to form a mixed opinion of the character. They commence persuading Paris of this claim and end up making him believe that their diagnosis is correct, he agrees to lead the villagers that have formed downstairs in a psalm but waits for the arrival of Reverend Hale, a seemed professional of the topic of witchcraft; he leaves the young girls, Abigail and Betty alone. Gregor's transformation causes tension and financial problems for the family and forces them to look for other means of income. Three lodgers then move into the house, paying a fee to stay and be fed. During the lodgers first meal, they hears Gregor screeching and the family announce to them that they keep a "pet".